The 2011-2012 series was sponsored by Lawyers’ Rights Watch Canada (LRWC), Hul’qumi’num Treaty Group (HTG), Amnesty International and the Vancouver Public Library. Is the Supreme Court of Canada colonizing Indigenous peoples? Dr. Grace Woo takes a hard look at Anglo-Canadian legal history, international law, and Supreme Court of Canada reasoning. She explains how her research can be used to diagnose the remnants of colonialism that continue to haunt Indigenous and other Canadians alike. Dr. 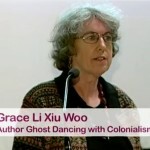 Woo spoke at the Vancouver Public Library 12 January 2012. Part 2: Grace Woo, continued.